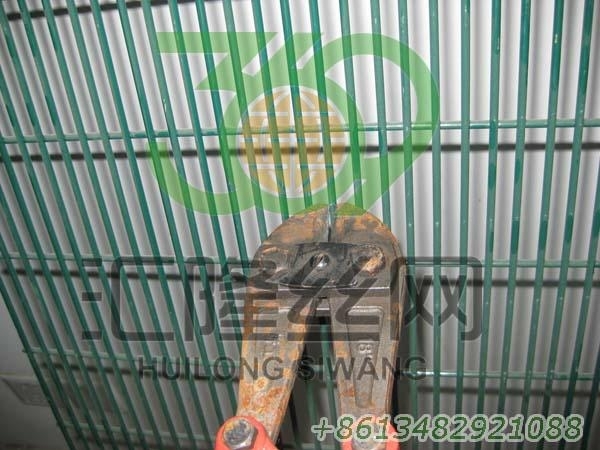 Technical description of 358 fence panel:Mesh Pattern: 76.2mm (3") x 12.7mm (0.5") resistance welded at each intersectionHorizontal Wires: 4mm diameter at 12.7mm centresVertical Wires: 4mm diameter at 76.2mm centres. Surface treatment:1.Fence panel manufactured from electro galvanized hard drawn wire,then with powder coating;2.Fence panel manufactured from low carbon steel wire,then electro galvanized with powder coating;3.Fence panel manufactured from low carbon steel wire,then with heavy hot dipped galvanized coating.4.Fence panel manufactured from Galfan wire,then with powder coating. Technical description of 358 fence post profile:1.Post section:80x60mm,80x80mm or 120x60mm;2.Plate of post thickness:2.5mm or 3.0mm;Coating:Internally and externally galvanized (minimum 250g/m2 both sides combined).Powder coating(minimum60um).Colors:RAL6005,RAL9005.Other colors also are available.Finish Top:80x60mm and 120x60mm are metal caps.80x80mm is plastic cap. Fixing fittings:1.Metal clips with post and mesh panel.2.Cover plate with bolts with post and mesh panel.